How to make a personalized Monogram Wreath to hang on your front door. A simple DIY craft tutorial idea. Create custom personalized home decor. How many wreaths do you own? Sadly, I own too many to count. I have a whole shelf of wreaths in my storage room. I absolutely love wreaths! Even more, I love making my own wreaths! My latest DIY wreath is a monogram wreath. Would you like to know how I made it? Well, I thought you’d never ask! Supplies Used: Some affiliate links are to similar items when exact items couldn’t be found online. Begin by cutting fabric into 2-inch strips. How many strips you need will depend on the length of your piece of fabric. My fabric was 2 yards, so I ended up needing 4 total strips. 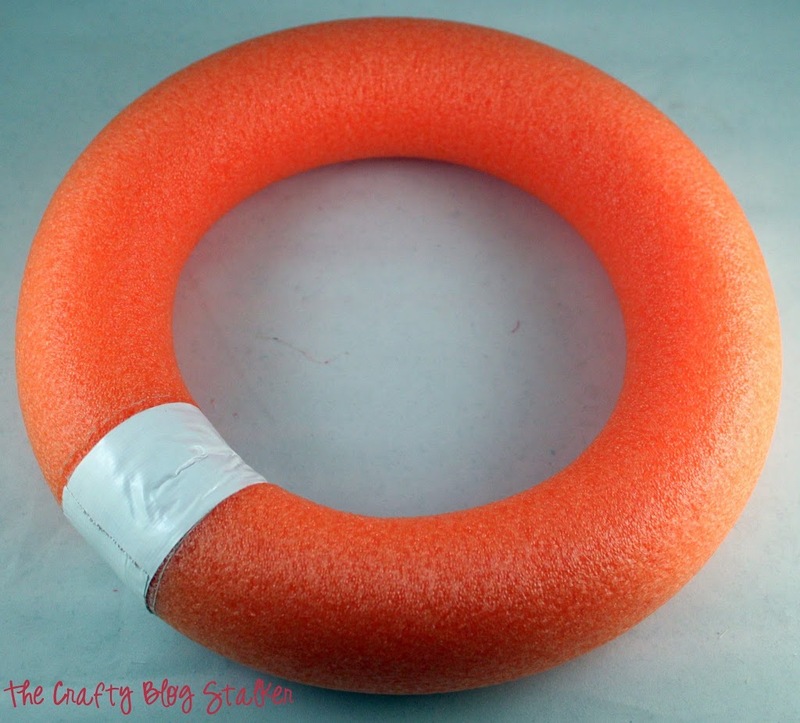 For the wreath base, use a pool noodle cut in half, with the two ends duck taped together. 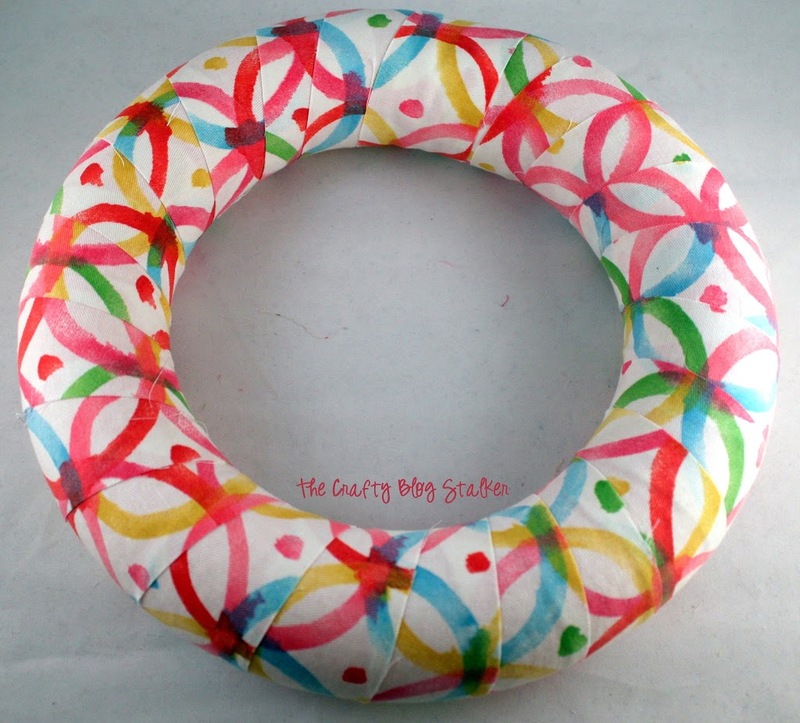 It makes a wreath form so much cheaper and they are really easy to make. 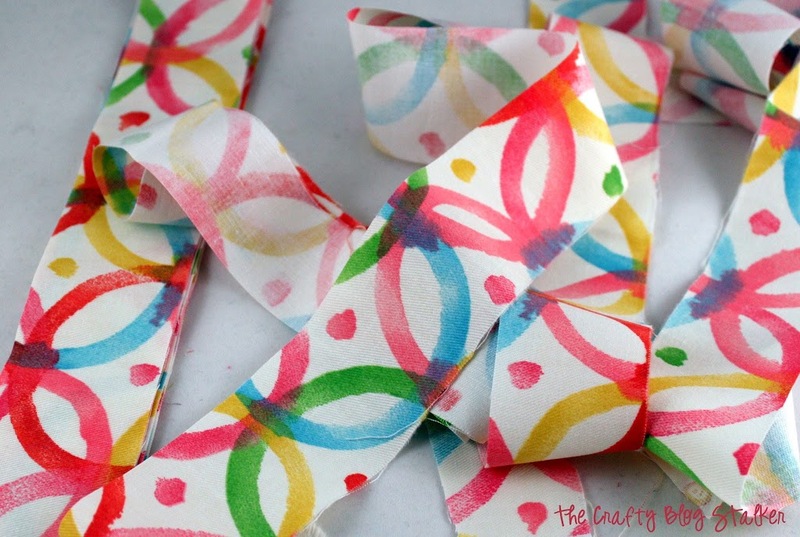 Start wrapping the strips around the form by hot gluing the beginning of a strip of fabric to the form and then wrapping around and then using the hot glue again the end of the strip to the wreath. With each strip, I make sure that I am always hot gluing on the back of the wreath so they won’t be visible on the front side of the wreath. For my wreath, I used about 3 1/2 of the strips of fabric but it may be more or less depending on your size of the wreath and the length of the strips of fabric. The wreath is cute at this stage but it definitely needs a little more. This is where the fabric flowers and monogram comes into play. Before I can start decorating with the flowers, I want to cover the letter with some green scrapbook paper and mod podge . 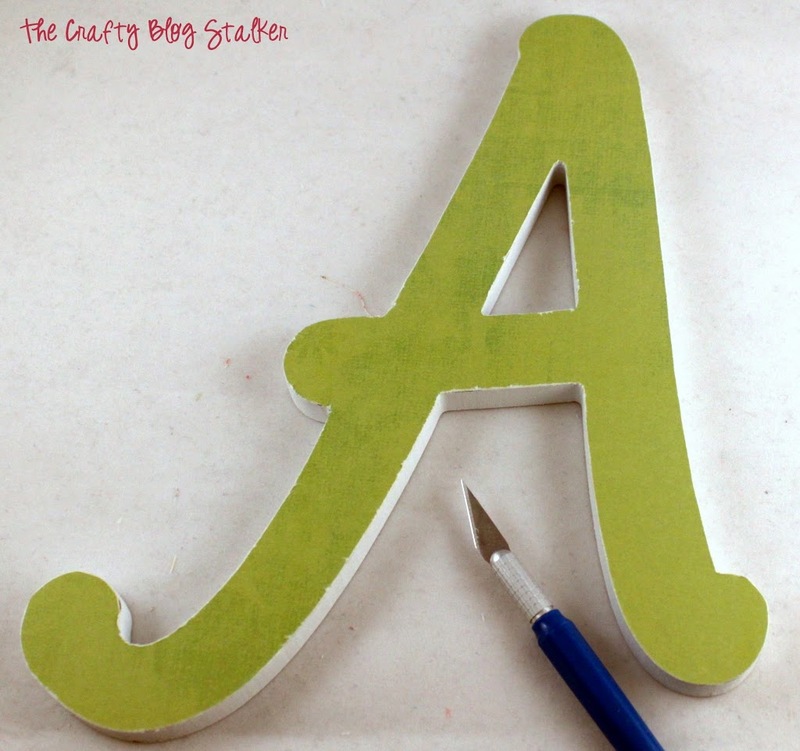 Apply a thin coat of Mod Podge to the front of the letter. Put the letter face down on the back side of the paper pushing it down all over the letter. Let this dry for about 5 minutes before turning the letter over. 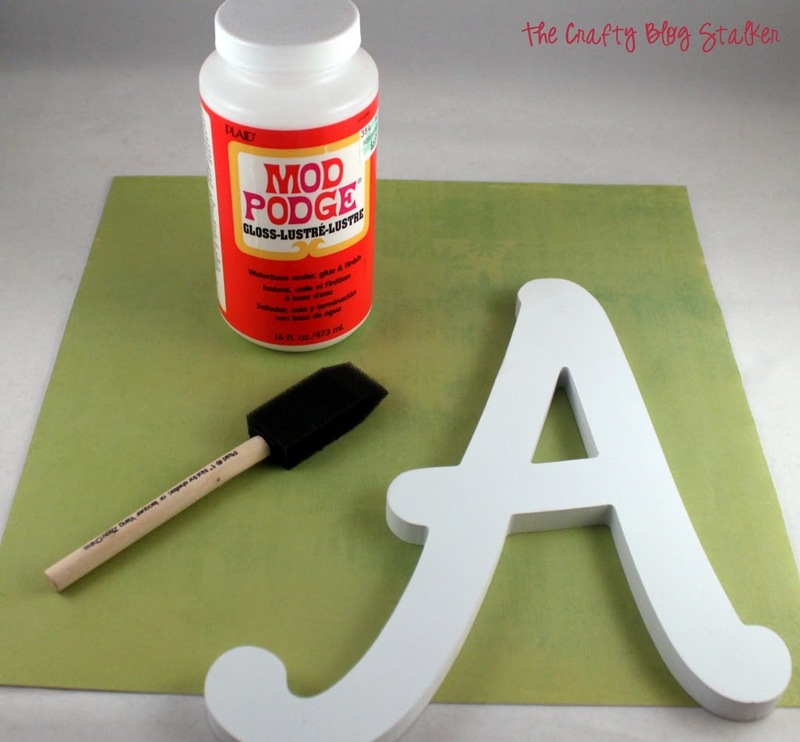 When the mod podge is completely dry, turn the face down and cut around the letter with an exacto knife. There were a couple rough edges when it was all done so I went lightly around the edges with a nail file to get rid of the paper frays. Arrange the monogram letter and flowers in different positions around the wreath before deciding on the best placement and gluing everything down. To hang the wreath, take your ribbon and glue it around the top of the wreath, but not tightly. 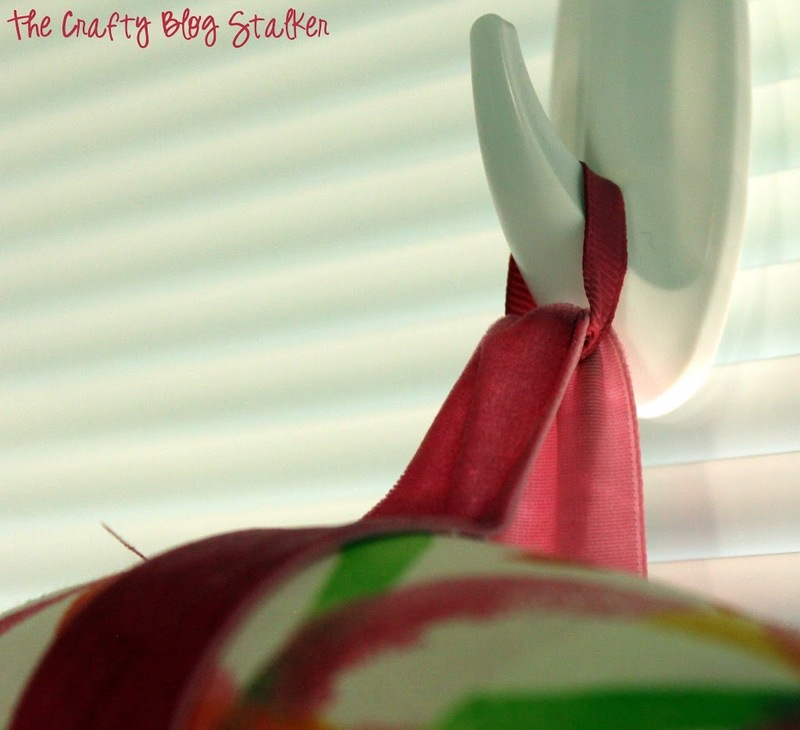 I left a little slack so I could tie another piece of ribbon to it to actually hang it. This wasn’t my favorite method, but I wasn’t sure what else to do. Here is my wreath hanging on the inside of my back door. Where do you put wreaths in your house, indoors or out? Share and leave a comment below! 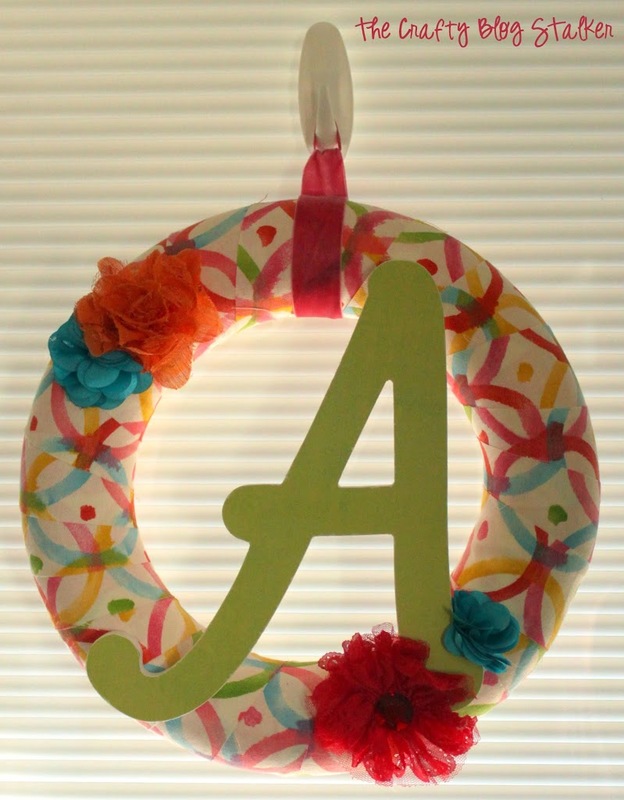 SAVE HOW TO MAKE A FABRIC MONOGRAM WREATH TO YOUR FAVORITE DIY PINTEREST BOARD! I love the colours! I’ve never made a wreath and they totally intimidate me but yours is fantastic. This is so cute! 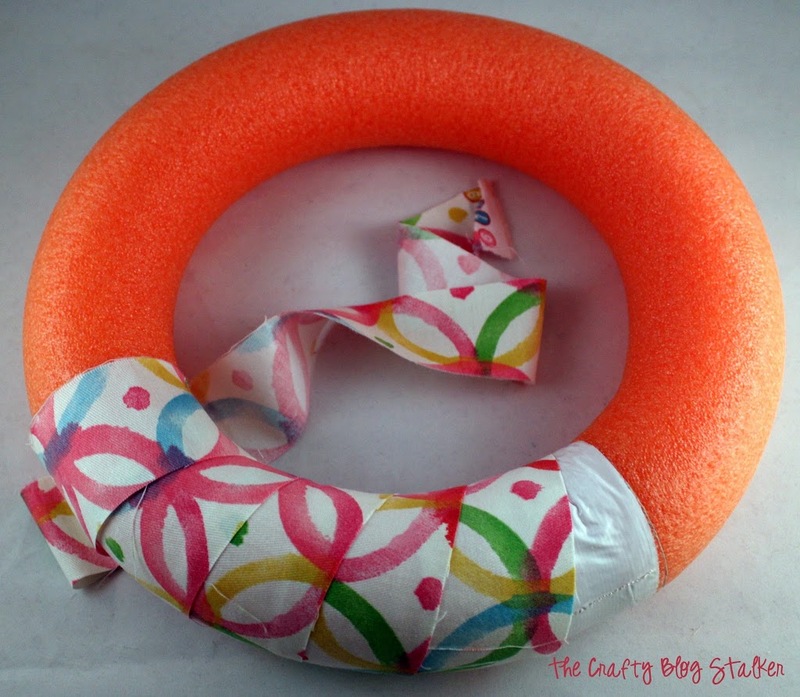 Such a good idea to use a pool noodle. I never thought of that. I’ve been looking for a wreath for my new home so this is perfect. Super cute project, love it! Thanks for sharing! Great tutorial! I love the cheerful colors too! I am getting ready to hang an old window in my eating area and need a wreath for the middle. I just can’t decide what kind to make!! A fabric one looks easier than some! Thank sfor sharing! Every Southern girl loves a wreath on their door. And I am no exception! I love this colorful, monogram wreath! The fabric is so bright and cheerful. If you have a chance hop over to my blog to check out the Sofia the First Birthday wreath I made for my daughter. I used a pool noodle, too! Katie this is super cute! I don’t do a lot of wreaths (just not a season decorator so i miss out on a lot of things like this) sO I would love it if you came and shared it with my readers on my link party! Looks fantastic and I need a new wreath, so I’ll try this with some left over fabric I got on http://www.organiccottonplus.com, thanks! Thank you so much for sharing your craft on last weeks Thrifty Thursday! I have Featured your post this week, and we hope you will share again! Thanks, Janet. I am so glad that you like my wreath! Super cute wreath, and thanks for the handy tip about the nail file! I wouldn’t have thought of that! Thanks for sharing at Merry Monday! You are welcome, Megan! I am so glad that you like the project!